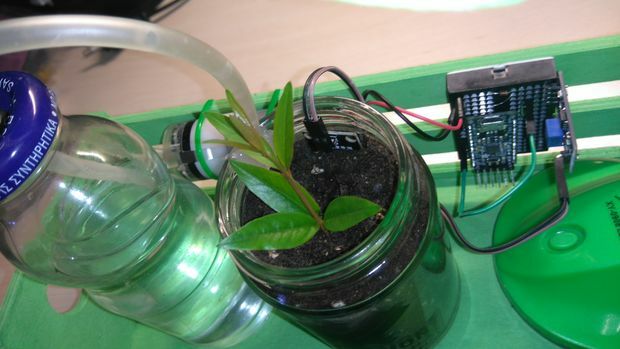 In this guide I will show you how to make your own - Arduino -automatic watering system for your "desk" flower (or plant). The whole procedure is very easy and you can complete this guide in about 30 min. 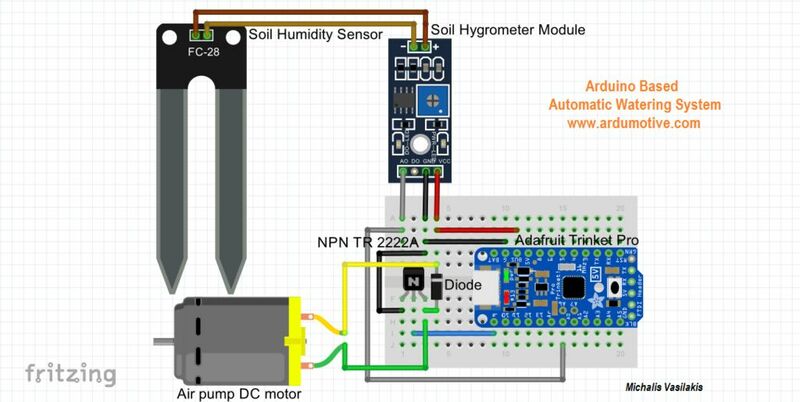 The goal is to automatically watered the plant when the soil moisture decreases, so we will use one "soil hygrometer" sensor for this measurement. 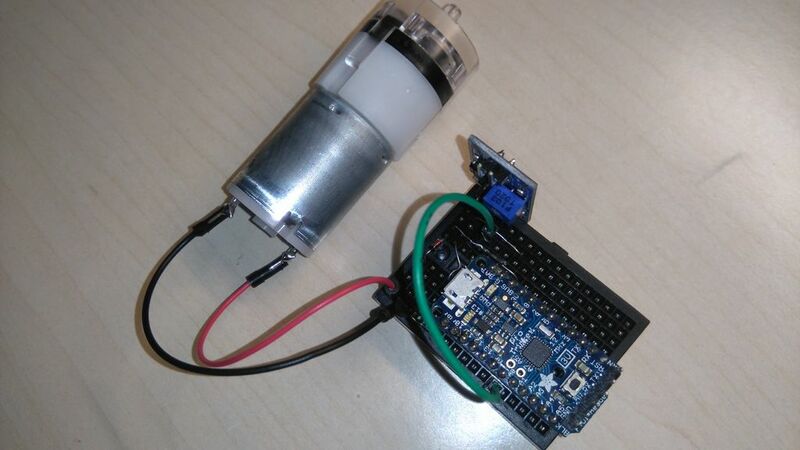 For watering, we will use one small air-pump motor that will blowing air into the bottle from one small pipe! The pressure will throw the water from the other pipe to our plant. I used the Adafruit Trinket Pro board for my system but if you want you can also use the Arduino uno, Arduino Pro mini or Arduino nano board. You will also need a hot melt glue gun to make sure that the bottle is airtight from the pipe holes. Make two holes in the cap of the bottle. Now see the first image above, one pipe must be on the top of the bottle (this pipe will be connected to the air pump motor). Use some hot melt glue on both sides of cap. The other pipe must be on the bottom of the bottle (this pipe will throw the water to our plant / see the second image above). Again, use some hot melt glue on both sides of cap. Now make sure that the bottle is airtight, if you blow air (use your mouth) from the pipe (small one) you must see the water gets out from the other one. The watering system is ready. 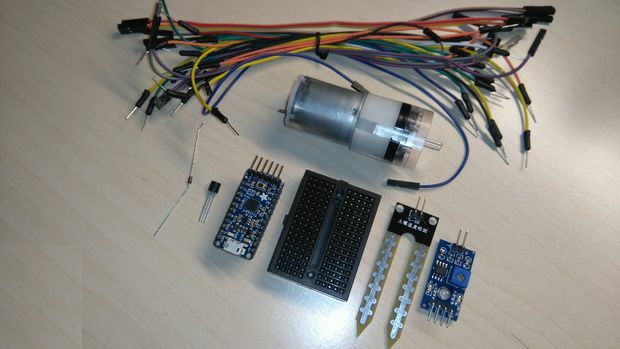 Now lets make it automatic with the Arduino and the soil hygrometer module. Read the comments to understand how it works. If you want you can make your correction by clicking the "Edit" button, try for example to change the percentage that will activate the watering system from 20% to 50% or 0. 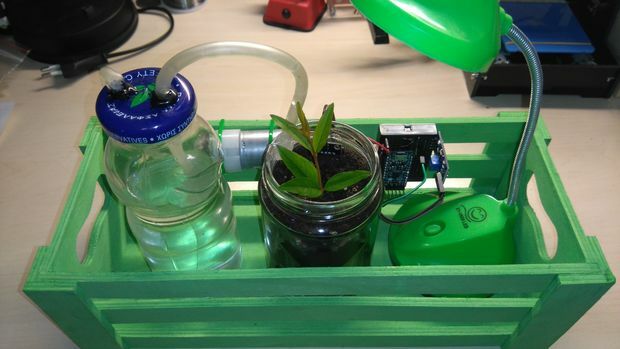 Now you have your own Arduino automatic watering system for your small plant or flower! I would like to see photos of your plants! I hope you liked this, let me know in the comments below.